After all the hoopla that was Cinco de Mayo this past week and what turned into a crazy one for us, we’ve started to turn back to the crockpot and grill for more of our meals to help settle our weeknights. We tend to spend lots of time in the yard afternoon during this time of year so quick meals are really needed and are much appreciated. 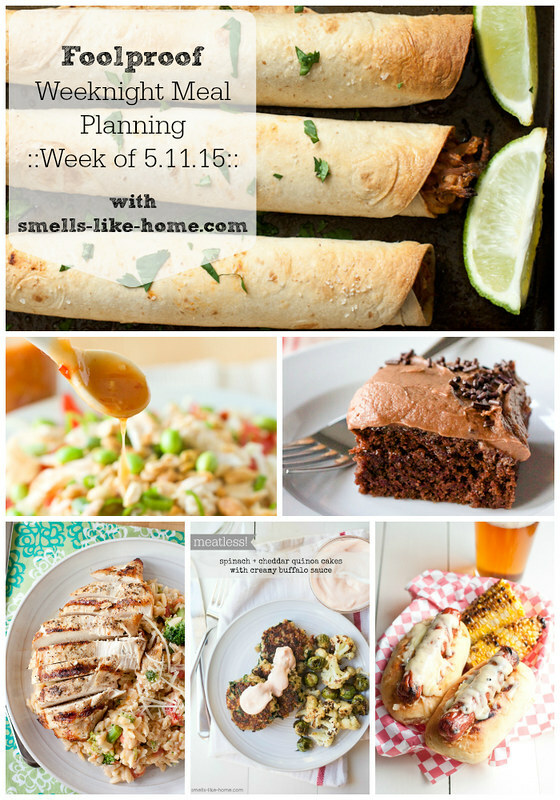 You’ll find this week’s menu to be just that, from pulled pork taquitos to healthy quinoa cakes, one of our all-time favorite dinners (see herb grilled chicken), a slammin’ salad, and a new twist on a classic sandwich (think really fun hot dogs!). I hope Mother’s Day tomorrow is wonderful for all of you – I’ll be at the beach with my mom! – and that the week ahead is a great one! Enjoy!! spinach and cheddar quinoa cakes with creamy buffalo sauce: These quinoa cakes have become one of my biggest go-to meals over the past couple of months. 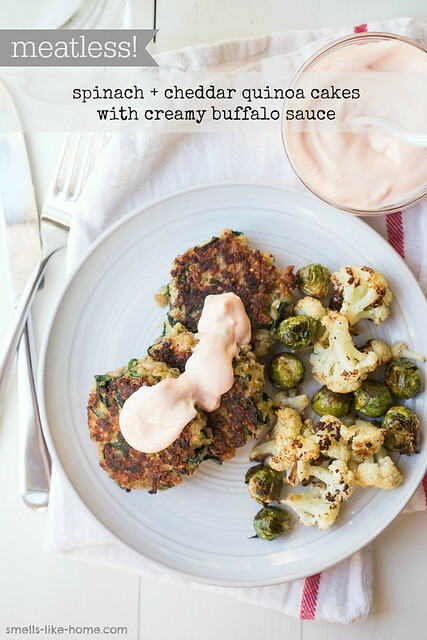 They’re healthy, hearty, super flavorful, and ever-satisfying and the yogurt buffalo sauce is the ultimate topping. Served with some fruit, a small salad, or baked fries, you definitely can’t go wrong with these little cakes! Tip: I’ve found these quinoa cakes to be super easy to assemble and recently, I’ve been cooking big batches of quinoa and farro on Sundays for meals during the week and then simply the cakes for dinner after work. So easy! 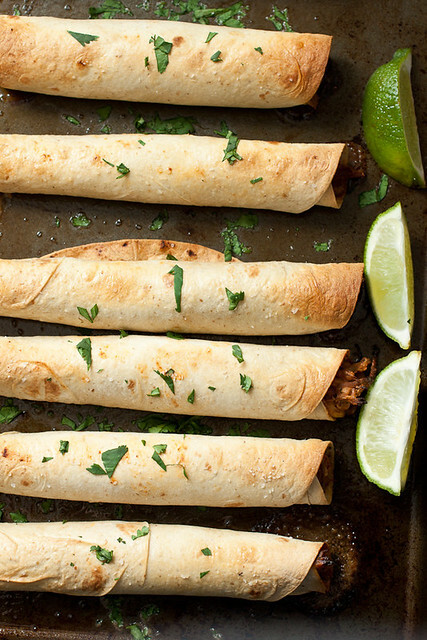 baked bbq pork taquitos: I always seem to have a bag or two of leftover pulled pork in the freezer and when my weeks get chaotic, I pull some pork out to thaw in the fridge for a day and make these baked bbq pork taquitos at night. Mix it up with some cream cheese, bbq sauce, spices, cilantro, and lime juice then roll everything tightly in tortillas and bake until the edge are crispy. These taquito take 25 minutes tops to make and dipped in some cool sour cream or avocado ranch dressing and I’m a happy woman. Tips: Pulled pork is truly one of the most satisfying things that I make and since it’s a completely hands-off dish (crockpot or slow-cooked in the oven), I can make a big batch without any effort and freeze the leftovers for taquitos, sandwiches, or burgers. 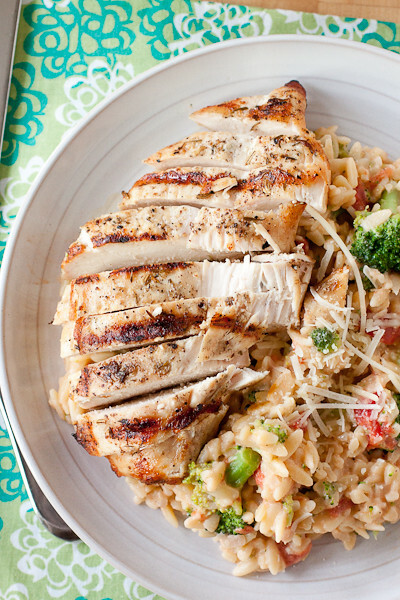 herb grilled chicken with creamy broccoli orzo: One of the first meals I ever blogged about was this herb grilled chicken with creamy broccoli orzo and it was this meal where I proved to myself that I could hack it in the kitchen. The chicken, of course, grills up in just a few minutes, leaving plenty of time to make a silky, cheesy sauce, boil some orzo, and toss in a few veggies. This is one of our very, very favorite meals and it’s one that will forever be in my repetoire. Tip: If your chicken breast are on the thick side, consider pounding them to about ½-inch thick, sprinkle with herbs, cover, and refrigerate the night before you need them (or even earlier in the day). This will save you a few minutes at night and you can get the grill heated up while the water for the orzo boils. thai crunch chicken salad: Behold one of the most outstanding salads you’ll ever put in your body! 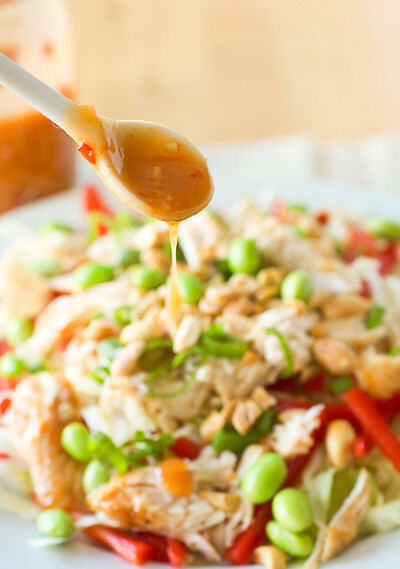 Surprisingly, you’ll simmer a sweet chili sauce-coconut milk mixture that will become both the marinade for the chicken and the dressing (when cooled). It’s an AMAZING dressing and it totally makes the salad. Filled up with loads of veggies – shredded raw cabbage instead of lettuce – this salad is a healthy one to boot! Tip: Since the marinade/dressing needs to be simmered for a few minutes before you cook the chicken, make it up to 1 week ahead and chill it until you’re ready for the salad tonight. grilled reuben hot dogs: In the past few years, I’ve really embraced the reuben sandwich. While in the city a couple of years ago, we had lunch at the Carnegie Deli and while squeezed-in shoulder-to-shoulder with the strangers sitting next to us, we stuffed the most gigantic open-faced reuben into our faces and then promptly took half of each of our sandwiches to-go for dinner. 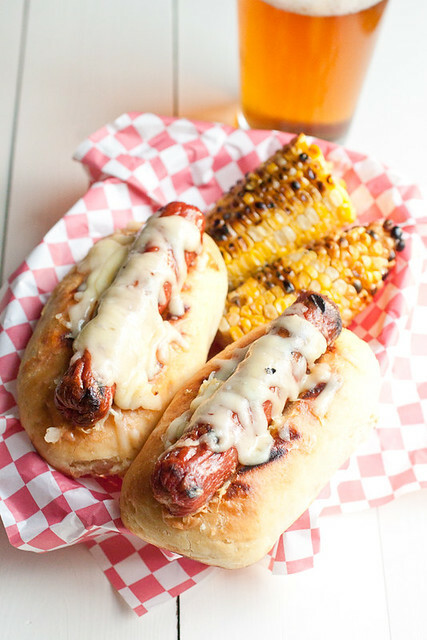 These hot dogs are a nod to my new favorite/the ever-classic sandwich and all grilled up with a cold beer on the side, Friday night is looking pretty darn good. Tip: Go with your favorite hot dogs for these reuben dogs. For years we’ve loved New Haven’s staple, Hummel’s, but have more recently been loving Applegate’s all-natural dogs. 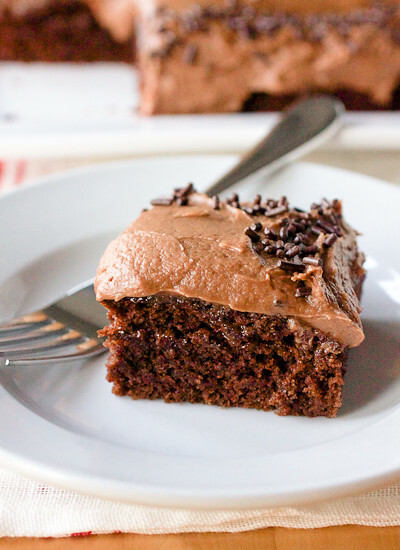 no-bowl double mocha snack cake: This may just be THE most simple cake you could ever make! You’ll mix everything together in the baking pan (hence, no-bowl) and in less than 30 minutes, you’ll have an impossibly soft and addictive delicious chocolate cake. Add your favorite frosting (see the recipe for a fudgy mocha version or try my ever-favorite chocolate cream cheese frosting) and dig in! I dare you to go back to a box mix after you try this simple recipe.